We look forward to your comments! We hope you enjoy it! The induction heating was applied firstly in the industry for melting metals. Ferranti in 1887 designed a melting furnace as shown in the fig. 1.1. The configuration of its geometry allowed the possibility of charging solid scrap while the energy developed in the molten bath by Joule Effect, gave the fusion and the overheating until the casting temperature. This idea was applied successfully by Dr. F. Kjellin Sweden, who, around 1903, designs and builds an open channel induction furnace. (fig. 1.2). When he applied to steel melting this technology it presented operational difficulties due to the oxidation of molten metal and refractory materials (very high temperature), so the idea was practically abandoned. It was in 1915 when the American J.R. Wyatt develops the idea of the vertical channel (fig.1.3). In that case, the metal remains protected from oxidation and reduces or eliminates the “pinch effect” (contraction of the channel) because of the metalostatic pressure of the molten metal placed above the channel. It was initially applied to the fusion of the brass and it had a very rapid global spread, eliminating practically reverberatory furnaces. In 1918 the American Professor Dr. E.F. Northrup patented an induction furnace without core of high frequency (Fig.1.4) based on the oscillating discharge of a circuit consisting of a capacitor (which is charged to 50 Hz in a phase of the cycle), a reactance and resistance of the coil of the furnace that surrounds the crucible without magnetic core between primary and secondary. In 1927 the first furnace of medium frequency is installed in a factory of Sheffield (England). Since then, the number and size of installations has not stopped growing. 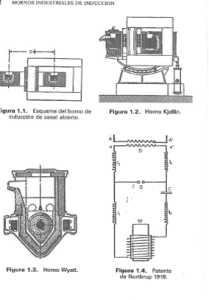 “HORNOS INDUSTRIALES DE INDUCCION-Teoria,Cálculo y Apliciones-. The most important work in safety and health for the companies is identify the best practices in the risk areas and create guidelines for safe work performance. INSERTEC, works on this point; for this reason we areconcerned about workers, who manipulates our products.protection against hazardous substances, READY TO BE USED.